by Hugh Duncan. Published on 15 November 2018. Back in 2012 I searched the Internet for polygons that lacked a bit of an edge, but found nothing, so I worked on them myself. Let us have a look at the thinking process behind these little-known polygons. Look! The internal angle has now become negative! A (regular) 3/2-sided polygon contains angles, each of which is -60°! What new monster have we created?! This is where we go down the rabbit hole, if we haven’t already gone there that is! Okay let’s draw it! Consider the first side as being drawn horizontally from left to right (see above). The second side would start with a dotted line extending from the right end of the first line to find the original direction (east) and hence, next, the external angle. To draw this angle, one can now measure anti-clockwise from the dotted line until 240° is reached. Note the second side has now crossed over the first side and ends 60° below the first line. The second side can now be drawn 60° below the first. The crossing over explains why the internal angle is -60°. I have left a ‘loop’ at the vertex, to show that it has overturned the first side. The third side can be drawn as before, creating another angle of -60°, including the loop of course. Before we join the second and third, we first have to turn again through 240° anti-clockwise, creating a third loop. Three sides have been drawn and taken two turns (3 lots of 240° = 720° = 2 turns), to complete a closed polygon, hence that is 3/2 sides per turn or 1.5 as expected. This polygon looks like an equilateral triangle. It is like taking an iron bar and over bending it into three equal parts. From left to right: the triangle, the 3/2-agon, the anti-triangle and the anti-3/2-agon. Compared to the normal +3 sided equilateral triangle, the triamisagon looks the same, and if one ignores the loops at each vertex, the +3/2-agon is the 3-sider but flipped upside down. A triangle of +3 sides has its arrows pointing anti-clockwise, the convention used in maths for a positive rotation. At first glance, the 3/2-agon has the arrows seemingly pointing clockwise, but this is because of the loops at each vertex. If one was a car following a route of this shape, then the car always turns anti-clockwise. Does anything like these shapes exist out there in the real world? Well yes it does! 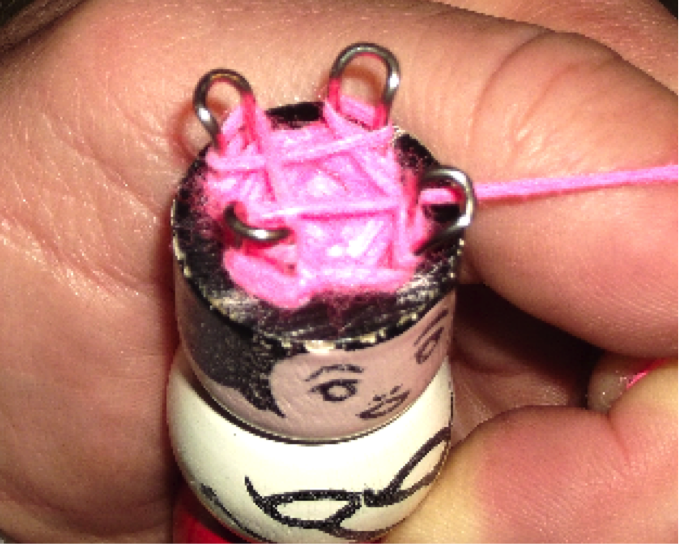 Who remembers the old Knitting Nancy? See figure below of me in action! Slip roads off motorways and most model car racing kits allow one to include a few loops. Clothes pegs, the Adobe logo and hand exercisers contain them too. A complete turn. We start drawing with one straight, horizontal edge going right (east). At the end, now we turn through 360° anticlockwise. This is a complete revolution, so we are actually facing the original direction. Not only that, we have created a little loop at this end (see diagram below). As we have not (yet) met up with the end of any edge, we draw a second edge from this point. This ‘second’ side continues in the same direction as the first, to the right (east). Now we turn through 360° again and once more we are still facing east, with a second loop. If we repeat this, the process will continue, forever adding another side, doing a little pirouette then edge, loop, edge loop, edge loop. We find that we made one side after one complete turn, two sides after two turns and so on, so $n$ sides in $n$ revolutions. In other words, this is one side per turn, 1/1, hence it is a one-sided polygon by our chosen definition! We could reduce the loops to their infinitely small size and our one side per turn shape will indeed look like a one long side that goes off into the distance in each direction. As we look at it, the area below the looping line would be the ‘inside’ of the shape while the area above it would be the ‘outside’. See diagram below: I have tried to picture this in some other real world way. The closest I have come is to imagine that our two dimensional surface is perhaps a cylindrical surface. Imagine taking a sheet of A4 paper and we draw a horizontal line across the middle of the paper. We then take the sheet and roll it into a cylinder, such that the right hand edge of the paper joins onto the left hand edge. Our 2D universe is the outside surface of this paper. The line we drew now makes a simple ‘belt’ or equator round the middle. Voila, a one-sided polygon. Above the line is the outside, while below this line is the inside. See below left. Would the real one-sided polygon stand up? According to Wolfram, a polygon with one side is called a henagon. There is no shape that exists in Euclidean space with one (straight) edge. It is typically drawn as a circular line that joins back up with itself (see right). The circumference of the henagon is just one edge and when drawn like this, it clearly has an inside and an outside. I would like to suggest that my equator around a cylindrical 2D world version and my infinite line with equally spaced loops should also be an acceptable alternative. This is turning through more than one revolution between sides. Crazy! Draw a horizontal line pointing east. 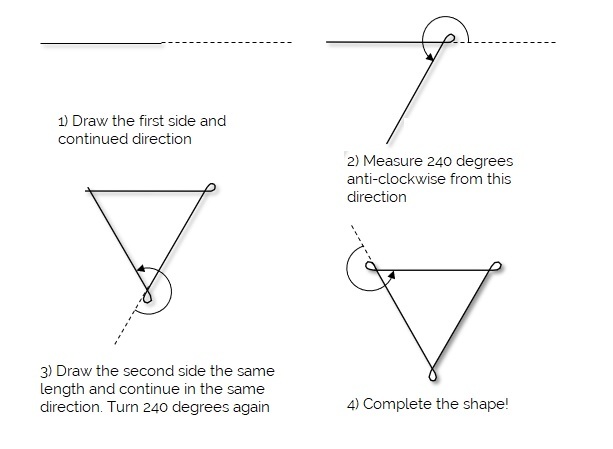 At the end, turn anti-clockwise through 480° and draw a second line. Note we covered a complete revolution and then managed another 120°. See below, second shape from the left. Notice also that the little loop we drew to distinguish these low-sided shapes is now on the inside! Now turn through another 480° anti-clockwise and draw a third side. Like the bending of the iron bar, we have made a full loop plus a bit more and this loop is also inside the shape. All we have to do is make our final spin of 480 and join onto the start of the first side (see below, second shape from the left). We have made 3 sides but we have turned through $3 \times 480 = 1440°$. This is four compete turns (1440/360 = 4), so 3 sides in four turns would be written as ¾ or ¾ of a side per turn. This looks like the equilateral triangle (and our 3/2 sided polygon, which was also looking like an equilateral triangle), but this time with the little loops inside the vertices. If we were to repeat the same process for other simple fractions between 2/3 and 1, we get the next section of polygons that look like our original ones with more than two sides, but with the identifying internal loops. See a selection of them above. Not surprisingly, there will be a similar set of anti-polygons between -1 and -2/3 on the other side of zero that will look like the set above, but as ‘holes’ with the equivalent shapes. And turn again (2/3 down to ½) and so on…..
Let’s keep going before the maths police stop us. Take $n = 3/5$ and the external angle is $360 \times 5/3 = 600°$. So we draw our starting line and turn 600° anti-clockwise, which is one complete turn of 360° and then a further 240°. We do this two more times and we get a shape with 3 sides which has turned $3 \times 600 = 1800°$ or five revolutions, i.e. three sides in five turns or 3/5 sides per turn. See below. Note we have what looks like a triangle again but the loops are on the outside again and they are double loops. These double outside loopers are found between 2/3 sides and ½ sides. A selection of shapes from this range is shown below. This system ends at ½ with a string of one siders with double loops between them. There’s a pattern to these fractional polygons below two sides and all the way to zero. The next batch would have double loops inside and the one after that triple outside loops, then triple inside loops and so on. This continues all the way down to zero sides, each time adding an outer or inner loop and each stage taking up less and less of the polygonic number line. A few of those shapes closer to zero are shown below. These systems flip flop between outside and inside loopers, increasing an additional loop each time and the switching happens more frequently as we approach zero, but hopefully the trend is clear. It is now time to bring the topic to a close. A zeragon is a point, a vertex, and has no sides, so technically it can have no angle ‘inside’ as there is no inside. As with the monagon and those negative sided polygons, the outside angle is taken to be negative. 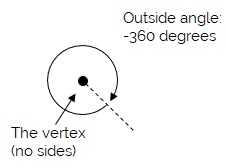 As seen in the diagram above, there is a complete 360º all the way round the outside of the point, so being outside it is -360º rather than +360º and this too obeys the general equation. Hugh Duncan graduated from UCL in 1980 having studied astronomy. He teaches physics and maths in the International School of Nice and is currently writing a popular science book on the topic of fractograms. A polygon with four and a half sides? !